The Lodge operates to provide 4 meetings each year for members to attend and each meeting is followed by a delicious 4 course banquet. 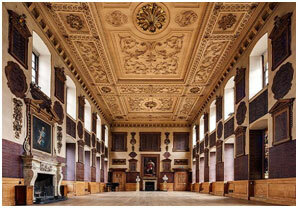 For those that would like to enjoy the ambiance of ‘The Great Hall’ and become immersed in its history. We serve tea and biscuits at 16.31. We adjourn to the bar before supper at 19.31. We usually finish around 22.00 – 22.30 when a few of us ajourn to a local hostelry. There is an annual fee, and a cost to dine at each meeting, if you choose to do so. ‘The Great Hall’ offers a stunning environment, steeped in history, outstanding dining with Georgian splendour and is an ideal setting for the Cholmeley Lodge and Chapter. Designed by James Gibbs in the 1730s, the magnificent Great Hall remains virtually unaltered and is one of the finest public rooms to be found in London. The approach to the Great Hall is by the famous Grand Staircase, decorated with superb eighteenth century murals by William Hogarth.